Have you heard of the term AR/VR? How about Virtual Reality and Augmented Reality? This new technology is now poised to make one of the biggest impacts, not only our daily life, but with how we will interact and learn in the near future. VR (Virtual Reality) is a computer-generated simulation of real life, while AR(Augmented Reality) layers enhancements on top of the real world. With virtual reality, you can experience human anatomy. With augmented reality, you can watch a human body pop out of your text book. At the forefront of AR/VR is Microsoft and their HoloLens technology. HoloLens is already becoming the premiere AR/VR development platform. It is a self-contained system, so there is no need to be tethered (hooked by cable) to a computer. With HoloLens, you are free to move about your room and experience the AR or VR worlds to the fullest. 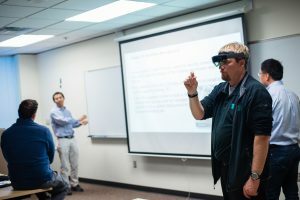 The business market for AR/VR products is predicted to hit $120 billion by 2020, and with this growth comes the demand for trained AR/VR professionals. AR/VR does not just span the tech and gaming industry, but is now integrated into the practices of various other industries such as healthcare, real estate, architecture, marketing, design and education, to name just a few. Salary ranges are high from $75K to over $100K. Getting in on this cutting-edge technology is not difficult. You don’t even need to be a programmer; although it does help. New development tools provide the user with the ability to use their imagination to create virtual worlds or to augment reality. The AR/VR development world is open to programmers, graphic artists, story tellers, film makers and most importantly, imagineers! Are you ready to get in on the action? Learn how to create technologies of the future in HoloLens AR/VR for Developers starting January 11.